Players at Gillingham Football Club will be wearing blue and black shirts next season after a row about which colour should be chosen was resolved. Club chairman Paul Scally said he had decided to call a halt to the speculation and opted for the blue and black version over an alternative white strip. Gillingham, who have played in blue for more than 60 years, announced last month the kit would change to white for next season. The news was met with anger by some fans, unhappy at the break in tradition, and the row led to Mr Scally threatening to quit the club. Last week Mr Scally gave supporters a chance to "vote with their wallets" by pre-ordering the kit of their choice. On Thursday Mr Scally said the blue version was already proving more popular with fans. Mr Scally said: "I think it is time to draw a line under this issue. Personally, I still prefer the white kit, as do most of the players and staff at the club who have seen it, but the blue and black hoops are attractive too so I am perfectly happy with the choice." Some fans blamed the change of colour on sponsors Sea France, believing the ferry company had had a say in what colour the shirts would be. 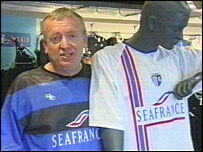 Mr Scally said Sea France had received faxes and letters from fans threatening to boycott their services. And he said if the abuse led to Sea France pulling out of the club he would also quit. The white kit will now be the first choice away strip with the all-yellow kit as the alternative.